U.S. Ag Secretary Tom Vilsack was briefly booed this morning during an appearance at the “Community Food Security Coalition” conference in Des Moines. The audience was filled with organic farmers and rural activists and one of them asked Vilsack what he’s doing to stop consolidation in agriculture so small-scale farms can thrive. A few people in the audience booed when Vilsack refused to say genetically-modified crops are bad and should be banned. 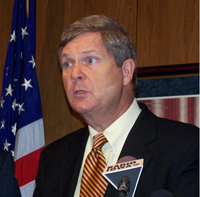 Vilsack told the crowd the so-called “factory farms” they denounce are necessary to meet world food demand. Vilsack did add that his agency may introduce livestock regulations which try to ensure small-scale pork and beef producers get a “fair shake” when it comes to the prices they’re paid for selling their livestock. Vilsack, who served eight years as Iowa’s governor, was the first U.S. Ag Secretary to speak to the Community Food Security Coalition, holding its 13th annual convention in Des Moines this week. Vilsack touted the U.S.D.A.’s promotion of farmers markets and efforts to encourage Americans to eat more locally-grown foods.